A Seat at the Table was four years in the making for Solange, and couldn’t have been released at (and for) a better time. 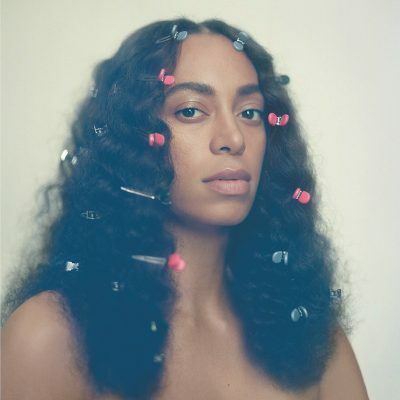 It crystallizes identity and Black experience into a thing of heartrending beauty that weaves between simplicity and ethereality, where Solange’s voice—deeply mysterious at times, silvery and feathery at others—effortlessly narrates an experience that fits right into current conversations about Black social issues. In addition to Solange’s own songwriting and production, the 21-song album includes eight interludes, featuring Master P, her father Mathew Knowles, Kelly Rowland and mother Tina Knowles, along with contributions by Devonte Hynes (Blood Orange), Adam Bainbridge (Kindness) and Kelela, among others. Though rich with collaboration, the project started as and is ultimately an exploration of Solange’s own identity and familial legacy, right down to the initial recordings done in New Iberia, Louisiana, where Knowles’ grandparents lived before fleeing the Ku Klux Klan. “Rise” and “Weary” make up the album’s base, wherein Solange sings out about this kind of falling down and getting back up, and then returning to the weariness of a world that makes things this way. A Seat not only shows the rise and the fall, but also what happens in between. With her influences listed as Kanye West’s triumphant song “We Major,” Claudia Rankine’s stark racial narrative, Citizen, Lauryn Hill’s controversial session on MTV Unplugged and Lynette Yiadom-Boakye’s paintings of black figures (who come to life in the colors, posturing and movements in the video for “Don’t Touch My Hair”), Solange seems to identify with these Black artists who also explore those in-betweens. In “Wear,” Solange sings, “I’m gonna look for my glory / I’ll be back real soon,” and she means it. She goes on to find her glory in “Cranes in the Sky,” the album’s light-filled and undoubtable hit.